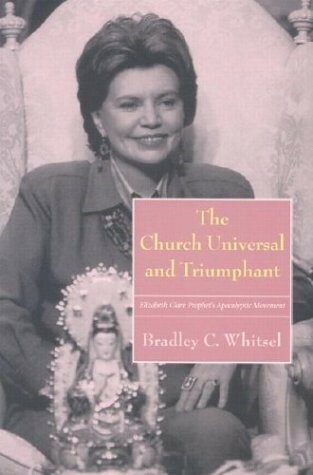 Bradley C. Whitsel, The Church Universal and Triumphant: Elizabeth Clare Prophet’s Apocalyptic Movement. Syracuse, NY: Syracuse University Press, 2003. Paperback, 221 pages. This is the most thorough and balanced study to date of the Church Universal and Triumphant. While Whitsel (a professor of political science at Pennsylvania State University - Fayette) provides a complete history of CUT, his most important contribution is in chronicling the increasing apocalyptic emphasis under Elizabeth Prophet’s leadership, following the death of Mark Prophet in 1973. "While Whitsel is cautious in reporting criticism from former CUT members, he does take modest note of these negative insider accounts, unlike other academics who have reported on the group." While Whitsel is cautious in reporting criticism from former CUT members, he does take modest note of these negative insider accounts, unlike other academics who have reported on the group. This reviewer would have wished for the author to include at least some comment on the pseudo-historical nature of the Prophets' claims regarding Jesus and his supposed boyhood travels to the Far East – the one aspect of their teaching most open to historical inquiry. For an article on this aspect of CUT teaching, see Jesus of the Church Universal And Triumphant.